We've got GREAT food - it's as simple as that. Our students have consistently ranked U of G as having the best food on any Canadian university campus! We're proud to be recognized as a Canadian leader for sustainability initiatives. We have won Ontario's "Local Food Champions" award, and continually source local food to feed over 5,000 students per day! At the University of Guelph, all food items are individually priced - just like a restaurant! You only pay for what you order. When you purchase an On-Campus Meal Plan, your Student Identification Card is your payment system for food purchases. Every time you choose a snack or meal, simply present your Student ID card to the cashier and the appropriate food dollars will be deducted from your meal plan balance. Wide-ranging food selections include popular comfort foods, international cuisine, pastas, deli, sandwiches, lots of fresh fruit and vegetables, extensive salad bars and some of your favourite brands such as Subway, Pizza Pizza, Starbucks, Tim Hortons, Made in Japan, Second Cup, Booster Juice and Williams Fresh Cafe. Food is available seven days a week, from 7 a.m. right through until midnight. 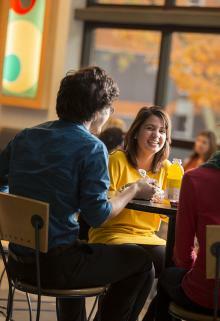 There are 17 different dining facilities conveniently located across campus. So whether you’re looking for a chai latte or one of your favourite comfort foods, options are always nearby. You can use your meal card to purchase food at selected off-campus locations in Guelph, such as: East Side Mario’s, Ray's Chinese, Quiznos, Pita Pit, Pizza Pizza, Domino's, Montana's, Milestone's, Kelsey's, Fionn MacCool's and Buffalo Wild Wings. Visit the Hospitality website for more great information, including current menus and schedules for our on-campus eateries!